Head of the Main Intelligence Directorate (GRU) of the General Staff of the Armed Forces of the Russian Federation Colonel-General Igor Sergun did not die in Russia but in Lebanon. Head of the Main Intelligence Directorate (GRU) of the General Staff of the Armed Forces of the Russian Federation Colonel-General Igor Sergun , was reportedly killed in January during a secret mission in Beirut, Lebanon the Lebanese daily newspaper al-Akhbar reported yesterday. The Kremlin announced the death of Sergun on January 4, but claimed he died in Moscow after a heart attack. Sergun reportedly played a key role in the Russian seizure of Crimea in March 2014, and reportedly died three weeks after he was sent to Syria by Russian President Vladimir Putin to demand Syrian President Bashar Assad step aside. However, according to al-Akhbar which is closely associated with the Syrian regime and the Hezbollah militant group , Sergun was killed in a complicated secret mission that several Arab and Middle Eastern intelligence agencies took part it. U.S. geopolitical intelligence firm Stratfor, also confirmed that Sergun was killed in Lebanon and did not die in Russia from a heart attack. Stratfor source reportedly heard a report that he died on New Year’s Day in Lebanon. Questions were raised by the intelligence community about what Sergun was doing in a country that is a hotbed for the world’s intelligence services and why the Kremlin would cover up his death abroad,” the Stratfor reported. Tass reported that the Kremlin has withheld comment on the Lebanese media version of the sudden death Sergun. “We have already voiced everything we could,” Russian presidential press secretary Dmitry Peskov said on Friday, answering a question about the Kremlin’s attitude to the insinuations and rumors around the GRU chief’s death allegedly in a special operation outside the country. “You have yourselves characterized these reports” (calling them rumors), he said. An obituary published on the Kremlin’s website noted his many decorations and awards, calling him “a man of great courage and a true patriot”. 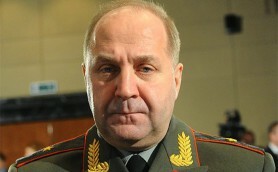 The Russian Defense Ministry gave no information on how or where he died, saying he passed away on 3 January aged 58. Well! Somebody’s doing a little ‘housecleaning’. Well (again) along with all the OTHERS doing their nasty little deeds in Lebanon, Lebanon SURE didn’t need the Russian gangs getting their fingers into the pies and mucking it up even more. Let’s hear it for SOME kind of ‘security’ monitoring. Among all the ‘Arabic’ factions, I’m sure they don’t need the ‘Crimea-Effect’ on top of it. AND, The Lebanese have been decimated enough by ASSadic action committees.